Several Killed In Egypt Amid Clashes Marking Anniversary Of Uprising : The Two-Way Police cracked down on demonstrators marking the fourth anniversary of mass protests that ousted President Hosni Mubarak. 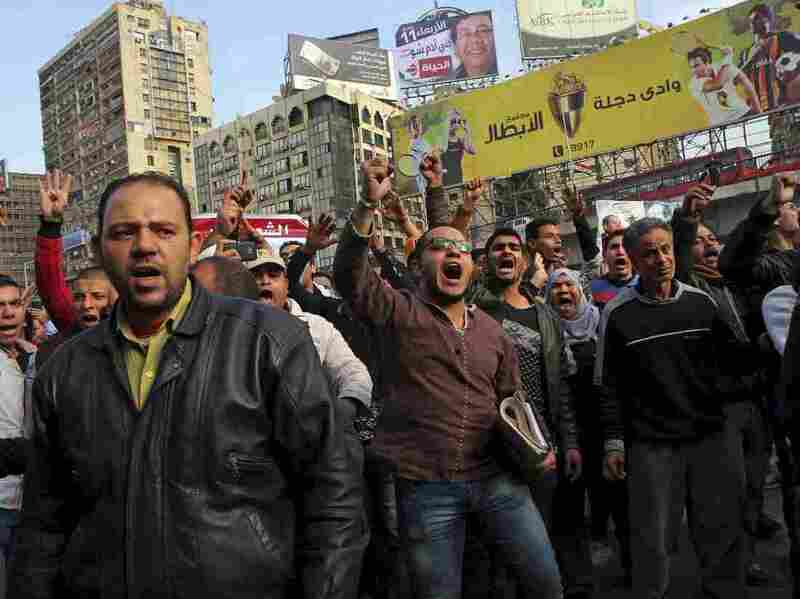 Protester chant slogans in downtown Cairo, Egypt, on Sunday to mark the fourth anniversary of of the 2011 uprising that toppled President Hosni Mubarak. Several people have been killed in clashes with security forces. At least nine people are dead in the Egyptian capital following clashes between police and Islamist protesters marking the fourth anniversary of 2011 uprising that ousted then-President Hosni Mubarak. The Associated Press said nine people had been killed, but Reuters and ITV News put the figure at 11. Both agencies cited unnamed security officials. The AP says another 13 people were injured in clashes in the Matariyah area of the capital. "The anniversary is a test of whether Islamists and liberal activists facing one of Egypt's toughest crackdowns have the resolve to challenge the U.S.-backed government once again. "Security forces have been stamping out dissent in Egypt since then-army chief Abdel Fattah al-Sisi ousted elected president Mohamed Mursi of the Muslim Brotherhood in July 2013 after mass protests against his rule."